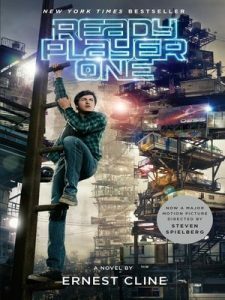 I borrowed an audio copy of Ernest Cline‘s Ready Player One from my local library. For those raised in the late 80s to early 90s this this was a sentimental cheese-fest of the best kind. But that’s really what carries the book. I enjoyed revisiting the geekery of my youth, but found the story pretty flat. It was quite predictable, the descriptions of the above mentioned geekery got tedious, it’s too dependent on coincidence and happenstance, and ultimately the ending of beat the baddy, get the prize and claim the girl was pat and unoriginal. All in all, I wouldn’t call it bad. I actually enjoyed it as a bit of fluff. But I wasn’t super impressed either. Thematically Will Wheaton was the perfect narrator for this book. He’s even mentioned in it. (How odd must that have been for him to read?) He did a fine job, but I wouldn’t say he was super engaging with it. This entry was posted in books/book review and tagged audio book, book review, sci-fi, YA on November 18, 2018 by Sadie.